All told, I’m trusting a family executive team that extols the virtues of “steady, sustainable growth” — and has at least £103m riding on the share price — can ensure the business stays out of trouble and instead continues to prosper and grow. S & U (SUS) can trace its history back to 1938, when Clifford Coombs cycled from South Wales to the Midlands — apparently with just £1 in his pocket — to begin selling pots and pans door-to-door in Birmingham. The following decades saw Mr Coombs’s venture evolve into Sports & Utility, which expanded by selling furniture, televisions and other expensive household goods on credit. The business also manufactured mens clothes and operated some sports shops. By 1975, S & U Stores started to transform itself into a home-based consumer finance lender. Doorstep moneylending subsequently became the group’s dominant income source… until the business changed tack the other year. During 2013, SUS’s fast-growing motor-finance division became the group’s most profitable subsidiary and two years later — after receiving an unsolicited offer — the home-credit operation was sold entirely. Called Advantage Finance, SUS’s motor-finance operation was formed in 1999 and supplies hire-purchase credit for customers wishing to buy second-hand cars. Transactions are sourced mostly through finance brokers and car dealerships. Borrowers currently number 42,000 and typically have lower/middle incomes and sketchy financial histories. 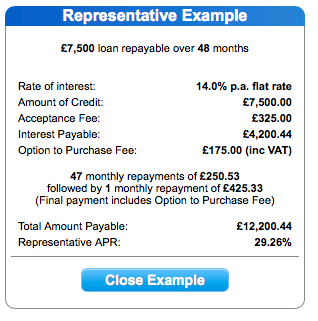 The average loan is for about £6,100, with the average repayment around £10,900 over four years. I suppose lending money to ‘non-prime’ borrowers at 29% so they can buy second-hand cars is asking for trouble. Should you wish to buy a used car with credit, Advantage’s website can give you a quote. SUS’s own website has a few more details about the group. SUS joined the stock market during 1961 and Companies House carries most of the group’s annual reports from 1984 onwards. It’s unfortunate that SUS’s archived reports have now become somewhat academic, as the old accounts are dominated by the performance of the now-sold home-credit division. However, the old reports do outline the past reliable nature of the wider group. In particular, the ordinary dividend has been lifted every year since 1987 except for three years — 2006, 2008 and 2009 — during which it was held. Of more relevance these days are the annual reports of Advantage Finance, which is now SUS’s sole subsidiary. These documents show Advantage’s revenue was £5.0m and its operating profit was £1.6m during 2001, the subsidiary’s first full year in operation. Just as commendable has been the absence of setbacks. Revenue has advanced every year since Advantage’s formation, while the only time operating profit decreased was 2010 (by 8%). On a pre-tax basis, though, Advantage has recorded profit growth every year. I am pleased the division’s financial performance has not been muddied by exceptional charges. The sole one-off item recorded within Advantage’s 17-year history concerns a £150k payment to a departing director during 2009. Advantage’s expansion has ensured SUS’s share price has made good headway. After bobbing between £2 and £6 for most of the Nineties and Noughties, the price had zoomed to £26 by last year after the growth of the motor division became much more apparent. The recent £21 share price was first witnessed during early 2015. First-half results published last September were impressive. SUS declared revenue up 39% to £28m, pre-tax profit up 35% to £12m and an interim dividend up 20% to 24p per share. Then during December, SUS revealed its customer numbers had advanced by 34% on the prior year and that trading had been in line with management expectations. “Despite widespread assumptions of “post Brexit gloom“, consumer appetite for credit, partially reflecting a robust labour market, continues unabated. This apparent contradiction has been recently reflected, for both S&U and for others in the speciality finance sector, in what I view as an unjustified decoupling of S&U’s performance and prospects and our stock-market valuation. The firm’s 2017 annual results ought to be published in March. The executive chairman who issued that somewhat forthright comment was Anthony Coombs, who is a grandson of the aforementioned company founder Clifford Coombs. Anthony Coombs is assisted in the boardroom by his twin brother Graham, who acts as deputy chairman. Both men joined SUS during the mid-1970s, although Anthony did have a stint as a Member of Parliament between 1987 and 1997. I do like my investments to be run by owner-friendly families that operate for the long run, and the Coombs brothers appear to fit the bill perfectly. Their grandfather, father and uncle have all run SUS before them, with the managing of day-to-day operations essentially handed to Anthony in 1999. Between them the Coombs brothers boast a 24%/£59m stake and, as far as I can tell, have barely sold a share during the last decade or so. I trust such shareholding inactivity is a favourable sign of further investment upside. Other Coombs shareholders include the aunt of Anthony and Graham, who enjoys a 16%/£38m shareholding, and one of her sons, who owns a 2%/£6m stake and sits on the board as a non-exec. Turning to director remuneration, I must admit the Coombs brothers are not lightly paid. Both men enjoyed pay rises last year and now collect salaries of £300k-plus. The higher wages seem a bit rich to me given the home-credit division was sold in 2015 and left the group with lower total earnings. What’s more, a third executive — Guy Thompson, the managing director of Advantage Finance — collects a useful £360k salary as well. I would certainly not quibble with Mr Thompson’s wage, as this particular executive has run Advantage from the start and has been critical to the division’s success. But I do wonder whether the Coombs brothers currently have much day-to-day influence on the group — especially as the executive office remains in Solihull while Advantage operates from Grimsby. In fact, it is not obvious to me why SUS currently requires three board executives on £300k-plus a year to run whole business. That said, I guess the executive presence of the Coombs family — and its significant shareholding — has been the major reason why SUS has delivered such a handsome long-term dividend performance. For some extra perspective, the salary of Anthony Coombs has compounded at less than 6% a year for the last five, ten and 15 years, while the dividend has grown at 16%, 9% and 8% per annum during the same respective timeframes. I can’t argue with that comparison. I should add that the Coombs brothers collect modest bonuses and own only a token number of options. There are pros and cons to SUS’s accounts. One definite highlight is the group’s history of growth based on reinvested earnings. At the last count, the balance sheet carried total shareholder equity of £131m — of which £127m was created through retained profit and just £4m through the issue of shares. What’s more, the balance sheet shows no goodwill and I could not find any reference to external acquisitions in those old annual reports. All this tells me the business has been created through ‘old-fashioned’ organic growth and has suffered little in the way of shareholder dilution. I note SUS’s option scheme currently represents less than 2% of the share count. I really admire this progress. Prior to 2012, the annual loan provision had always represented 30%-plus of revenue and 12%-plus of net customer receivables. Other bookkeeping plus-points include minimal amounts spent on tangible assets alongside a trivial final-salary pension scheme that last displayed a small surplus. Similar to most moneylenders, SUS operates with a not insignificant amount of debt. The simple theory is that the moneylender itself borrows money from a bank at a low rate, then lends it out at a much higher rate, and makes a turn on the difference. Assuming all goes to plan, borrowing money from a bank — rather than asking shareholders for extra funds — ought to be a more efficient way of creating superior returns for investors. At the last count, SUS’s net borrowings were £38m while net interest costs were running at £1.5m — or about 4%. While I much prefer my investments to operate with net cash — that way there’s less chance of a trading setback turning into a shareholder disaster — I have to recognise SUS has proven it can operate consistently well with borrowings. I guess the group’s £24m trailing operating profit can provide some room for manoeuvre with debt, too. SUS’s gearing calculation was 29% within September’s interim report and last year’s AGM statement claimed the figure would “not exceed 55% over the next four years”. The implication here is that further debt will be taken on. Total borrowing facilities are £85m, of which about half have been used to date. My return on average equity calculation based on September’s interim results is £18m/£133m = 14%, which is an adequate — but far from spectacular — reward from SUS’s lending. I am hopeful this 14% return can be improved over time though a combination of increased customer numbers, greater economies of scale and a tighter equity base as the business takes on additional debt. After all, SUS is now focused entirely on motor finance and I dare say further operational improvements at Advantage could be made…. while borrowing more money at 4% to then lend out at 29% should (in theory) create additional value for shareholders. Of the aggregate £71m operating profit recorded by Advantage during the last five years, £38m has been absorbed into working capital versus only £15m distributed as dividends (and £20m spent on interest and tax). The division’s history of rising revenue, profit and dividend suggest the significant working-capital reinvestment has so far paid off… but I need to be vigilant that such large reinvestment continues to deliver notable growth. Any large cash-flow reinvestment without the commensurate expansion would indicate possible trouble. Here’s how I decided it was worth investing at 2,070p. During 2016 SUS managed to produce revenue of £45m from average net customer receivables (customer loans) of £126m. With December’s trading update signalling net customer receivables at £189m, I thought near-term revenue may now be running at £66m. December’s update also revealed a loan loss provision of 18.5% of revenue. Applying that percentage, and assuming other divisional costs remain at 31% of revenue, and assuming central costs remain close to £3m, I arrived at a potential operating profit of £31m. Taxed at the forthcoming 19% UK standard rate, I calculated possible operating earnings to be roughly £25m or 211p per share. September’s interims showed net debt of £38m and my guess of current net borrowings was £46m. 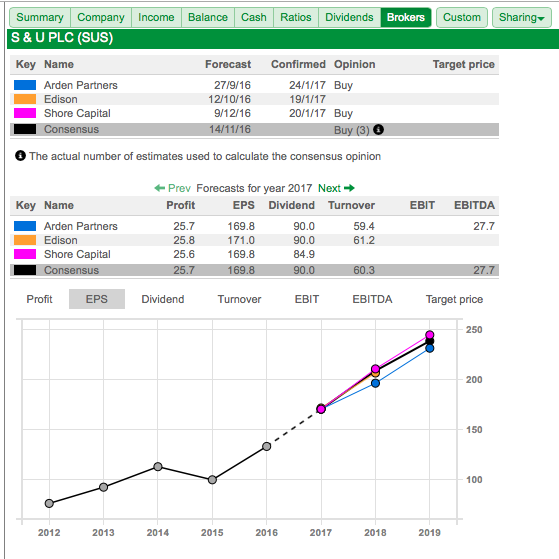 I added that estimate to the £248m market cap (at 2,070p per share) and SUS’s enterprise value (EV) came to £294m, or 2,454p per share. The possible P/E based on my EV and earnings guess was therefore 2,454p/211 = 11.6. That rating appeared very reasonable to me given Advantage has grown at an average annual compound rate of 15%-plus throughout the last ten years. My SUS investment is not without risk. One obvious threat is a possible recession. I’ve never really monitored the economy, so I may be totally blind to a forthcoming downturn… and widespread job losses could easily trigger greater bad debts at SUS. Something to bear in mind is that December’s update revealed loan provisions were currently running at 18.5% of revenue — versus 16.2% during 2015. So the recent trend is not perfect. Indeed, it is possible that Advantage’s positive progress during the last few years has been underpinned entirely by a recovering economy. Skilled credit-scoring and canny management may in reality have had little influence. Meanwhile, another danger that can hurt moneylenders is greater regulation. I recall doorstep moneylending suffered a Competition Commission investigation during the Noughties, which led to ‘fair rebates’ for early repayments and disclosures about alternative loans. Sector growth seemed to slow thereafter. More recently, payday lenders have been forced to introduce price caps and implement other changes. Citizens Advice claims demand for payday loans dropped by 35% soon after. I am not aware of any impending new rules for motor finance, but there is always the chance that SUS’s operating margin — which is close to 50% — may one day attract protests of ‘profiteering’. Finally, there is the age of SUS’s executives. The aforementioned Coombs brothers are both 64 while Advantage boss Guy Thompson is 61. So there is the possibility that the next few years will see a retirement or two — and fresh leadership may then change the successful culture of the business. I’m hopeful the Coombs brothers won’t call it a day just yet, as their father was an SUS executive until he turned 70. There is also a 48-year-old Coombs family member serving as a board non-exec, but I have no idea whether he is suitable for a lead executive position. I do worry a little about Guy Thompson departing. He has run Advantage since its formation and it is not obvious who his successor might be. I simply have my fingers crossed he won’t retire any time soon. As I mentioned at the start, SUS may not be everyone’s idea of a great business. Customers may prove to be unreliable, substantial borrowings are required to produce adequate shareholder returns, while recession, regulation and/or retirements may cause this investment to unravel. Mind you, I have a lot less to lose than the Coombs family. They have at least £103m riding on the share price and collect an aggregate £4m-plus annual dividend. I’d like to think they would not put such wealth at great risk. Certainly the present Coombs executives have shown a desire to expand the business in a controlled manner, and I am particularly impressed they could overlook decades of company heritage to sell the home-credit subsidiary. I am also impressed how the Coombs executives helped transform Advantage from nothing into a £248m market-cap business within 18 years. Of course, whether Advantage’s superior growth can continue — and whether I have paid an appropriate price for the division’s potential — may not be known for some years yet. In the meantime, I can only hope the majority of SUS’s customers continue to pay back their loans in full! This statement seemed quite encouraging. The Company is again pleased to announce that trading has remained strong and in line with market expectations; its final results will be announced on 28th March 2017. Advantage Finance, our motor finance business, finished a record year very strongly. Cash collections in the period exceeded a buoyant 2016 by 31%, whilst both transaction numbers and loan advances comfortably beat last year. This year Advantage achieved 20,000 new transactions for the first time, beating the previous record by nearly 5,000 deals; it now has a record 43,000 live customers. Loan quality remains good and, as reported in our last Trading Statement, is both stable and within our expectations. This fully justifies the additional £33million invested in the business in the year just ended. Within the last quarter, Advantage has received confirmation of its full licence authorisation from the FCA and has continued to introduce further refinements to its renowned underwriting and book analysis capabilities. As anticipated in December, our Aspen bridging finance operation has now received all necessary approvals, and we are pleased to announce it has now opened for business. We confidently expect a successful pilot over the next fifteen months. At the year end the Group has borrowings of £49m allowing good headroom within our total committed facilities of £85m. We anticipate concluding further loan facilities as our businesses require. The Group’s current trading and future prospects have led to your Board approving a second interim dividend of 28p per ordinary share (2016: 23p). This will be payable on 17th March 2017 to holders on the share register on the 24th February 2017. Together with the first dividend paid in November of 24p per share this will total 52p per share against 43p last year and 36p two years ago. These increases are consistent with our aim of returning to twice covered dividends over time. My guess of £46m for year-end net debt was £3m below the actual £49m. That should not make a great difference to my valuation sums, which I will revisit following the full results announcement. Cash collections up 31%, customer numbers up 32% (from 32.6k to 43k) and the second interim dividend (the company distributes three payouts a year) up 22% suggest the upcoming accounts will be pleasing.